Galileo and Voyager - Solar System Planets And Moons Section. Galileo and Voyager to find evidence of life. When NASA's Galileo spacecraft uncovered evidence that Europa's icy surface covers a huge ocean, scientists immediately thought... life. scientists have been analyzing pictures returned by Galileo and Voyager to find evidence of life. 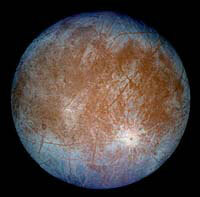 Several key chemical compounds, called biomarkers, could indicate life has existed on Europa. scientists are working on ways to simulate what those biomarkers would look like after being in Jupiter's immense radiation field so spacecraft could detect them from orbit. Mars Samples Brought Back To Earth. Since it was awarded a contract to study the feasibility of return samples of Mars back Earth, EADS Space has come up with two different directions. The first is to launch the sample ascent vehicle from the surface of Mars and dock with the return vehicle in space. In the second design, the ascent vehicle would reach orbit and then eject the samples for the return vehicle to "catch". How the samples are returned to Earth will make a big difference on the mission's cost, mass and complexity. SpaceDev Wins Its Largest Satellite Contract. SpaceDev announced on Thursday that it has won a $43 million contract to build micro satellites for the Missile Defense Agency (MDA). The four-phase, five-year contract will see SpaceDev build a micro satellite distributed sensing experiment (three to six microsats), and an option for a laser communications experiment. SpaceDev launched its first and only satellite, CHIPSat, just over a year ago.